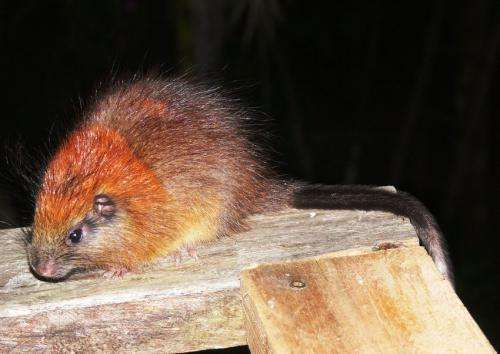 (PhysOrg.com) -- A unique and mysterious guinea-pig-sized rodent, not seen since 1898 despite several organized searches, bizarrely showed up at the front door of an ecolodge at a nature reserve in Colombia, South America. The magnificent red-crested tree rat (Santamartamys rufodorsalis), stayed for almost two hours while two research volunteers took the first photos ever of a creature the world thought would never be seen again. The charming nocturnal rodent made his re-debut to the world at 9:30PM on May 4, 2011 at the El Dorado Nature Reserve in the far north of the country. The Reserve was established in 2005 by Fundación ProAves  Colombia's foremost bird conservation organization  with support from American Bird Conservancy, World Land Trust-US, the U.S. Fish and Wildlife Service's Neotropical Migratory Bird Conservation Act, Fundación Loro Parque and Conservation International. The animal was rediscovered by Lizzie Noble and Simon McKeown  two volunteer researchers with ProAves monitoring endangered amphibians. It posed for photographs  including close-ups  before calmly proceeding back to the forest. "He just shuffled up the handrail near where we were sitting and seemed totally unperturbed by all the excitement he was causing. We are absolutely delighted to have rediscovered such a wonderful creature after just a month of volunteering with ProAves. Clearly the El Dorado Reserve has many more exciting discoveries waiting," said Lizzie Noble from Godalming, England. "The El Dorado Nature Reserve represents the ultimate Noah's Ark, protecting the last populations of many critically endangered and endemic flora and fauna; a living treasure trove like no other on earth," said Dr. Paul Salaman, the scientist from the World Land Trust-US who confirmed the identity of the species. "Had we not worked with our partners to establish this reserve, it is reasonable to believe this species would still remain something that was only talked about in science journals. Now we need to work with our partners to take steps to see that this species continues to be a part of our world," said George Fenwick, President of American Bird Conservancy. The red-crested tree rat will now likely be designated as Critically Endangered under the International Union for Conservation of Nature (IUCN)'s Red List of Threatened Species criteria. What is most concerning, however, is that much of the tree rat's potential remaining range is inundated with introduced feral cats that prey on native fauna. In 2005, Dr. Louise Emmons of the Smithsonian Institution examined the only two skin specimens of the tree rat known at that time. She identified a number of unique characteristics, and assigned the species to its own genus Santamartamys. 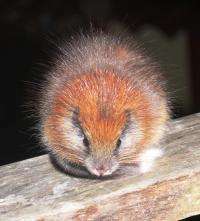 It is 18 inches long from head to the tip of the tail and is distinguished by a mane-like band of reddish fur around its neck and a black and white tail. The 2,000-acre El Dorado reserve is named after the legendary lost city of gold, and is internationally known as a unique destination for ecotourists. It is situated in cloud forests at 5,900 feet, just two hours' drive from the popular coastal tourist city of Santa Marta. The reserve and adjacent lands host the highest concentration of continental, range-restricted bird species found anywhere in the world, including the endangered Santa Marta Parakeet, Santa Marta Bush-Tyrant, and Santa Marta Sabrewing, all of which have their entire or major stronghold populations there. It also holds one of the highest concentrations of endemic and threatened amphibian species in the world. The reserve is listed as an Alliance for Zero Extinction (AZE) site, establishing it among the world's highest priorities for conservation, yet remarkably little is known about the area. "This discovery marks the beginning of a major effort to save the red-crested Tree rat and heralds the start of a global initiative in search of lost mammal species," said Salaman. Okay, that thing is just CUTE. Hope all this is in time, not only for this rat, but for the other species that are in trouble. Okay, that thing is just CUTE. For a rat.. Spectacular? I don't think that word means what you think it means. "I've come to turn myself in. I just can't live like a hunted rat anymore!" Oh my god, a cute red head. I sent this to my gf. She loves cute furry animals. but she hates mice and rats. Wonder what her reaction to this one will be. That_guy's girlfriend is about to go out and find one of these for a new pet. Rodent is actually very tasty. I've had Guinea Pig, Coypu also called Nutria, and Cane Rat. All of them were very clean tasting and no where near resembled chicken. OMG, what a little cutie it is aaaaaaaaawwwwwwwwwww. Is this the elusive Higgs-rodent? of all the places to show up and hang around for photos,you can't make that stuff up,this rat is self aware and trying to save his race. I saw one last nite at home...my cat brought it in...alive! This has absolutely nothing to do with "evolution" of rodents. This animal was thought to be extinct which means it existed and was obviously never extinct. Evolution of this animal would mean that another rat miracoulosly evolved into a species that had already existed. I do not think this is the way evolution works. Bottom Line: The creature existed and was seen as late as 1898. It evidently was never extinct although extremely rare. The population is now regaining a foothold regardless or in spite of "loss of habitat" and feral cats. If it is like other rat species it will find a way to adapt and proliferate. The other species of rats have no problem living and breeding just about everywhere in the world. 2,000 acres of high mountain is a scary thin life line for anything to be living by - a mere dot on the planet - but one that holds so much in trust.